I love my little blog. When it started a few years ago, it became such an outlet for me as a new mom (for round two) and as a NEW stay-at-home mom. The words gave me a release - they lifted weights off my shoulders. And, they still do. But at this time, I don't feel too many words coming. Maybe it's grief or anxiety - maybe a mixture of both. I feel like I'm currently in a time of research - what's next for me in terms of my career, my well being, and my little blog. 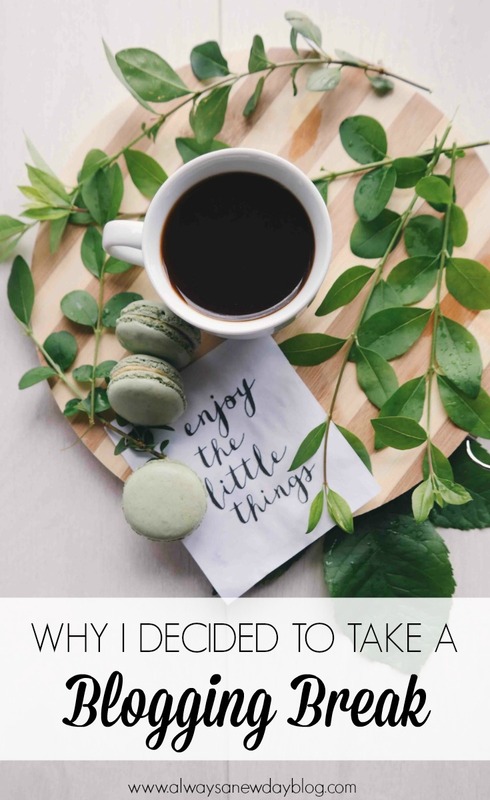 A favorite blogger recently posted she was letting it all go, and while her reach is far greater than mine, her words connected to my current anxiety with all things. And like her, I think a blogging break - and maybe an entire social media break - is necessary. I won't leave this space alone for long, but I definitely feel the pull to stop for a bit. To enjoy this holiday season. To feel all the feels that come with the chaos and ultimate JOY of this season. I don't want to spend it scheduling posts or writing gift guides or holiday survival tips just because everyone else is doing it - I want to write when I feel the urge to share. The good, the grief, the joy, and the anxiety. After all, that's why I started this space in the first place. Some days, I don't feel anyone is reading, and I have often felt like I am stuck in this social media game - followers, likes, collaborations. Others are rocking it, and I am over here praying my words connect. I don't like how it's added to my anxiety, so when saying no is my new motto, I feel the pull to say no to that silly game I just can't seem to get on top of most days. Always A New Day was formed because I needed my space - I needed to feel like a person behind the mom title. I wanted to write because my dad liked reading. I wanted to write about how anxiety is a daily struggle. And then I had to write about grief after losing my brother. When I chose the words, I then was choosing the right time to post them or the right photo that would increase engagement. I just don't want to anymore. I think on my break, I will spend time writing. Just writing. The old-fashioned way. I will look into exciting career opportunities that have come my way. I will get healthier - mainly on the inside than the out. And when I come back, if you're still here, I hope you find words that resonate with you. Thank you for blessing me with your support. Have the best holiday season - spend it loving one another, being kind, and taking care of yourself, too. I love your honesty and transparency. You are one beautiful soul! I don’t like the ugly side of social media and this blogging world. It corrupts the soul if you allow yourself to be dragged in to it. I don’t like the pattern everyone starts following, copy & paste kind of thing. But there’s the good, people like YOU! Friendships built, honest post, the reality of life. A break sometimes it’s all we need to refocus and listen to where God is really leading us. Love you! Love you back, my friend!! Thankful blogging brought me to YOU! With this background, the difference between a company or a corporation may be of cosmetic nature so far as the ownership and internal workings are concerned. Positive site, where did u come up with the information on this posting? I'm pleased I ran across it though, ill be checking back soon to learn what additional posts you include.